Melissa & Doug Wooden Train Set Just $77.99! Down From $130! PLUS FREE Shipping! 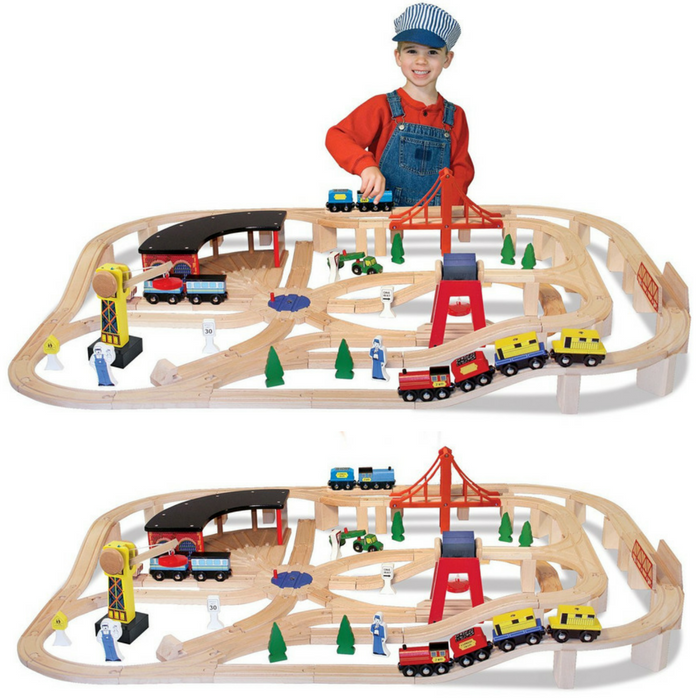 You are here: Home / Great Deals / Amazon Deals / Melissa & Doug Wooden Train Set Just $77.99! Down From $130! PLUS FREE Shipping! Here’s another great deal you can get at Amazon! Score this Melissa & Doug Wooden Train Set for just $77.99 down from $129.99 PLUS FREE shipping! This amazing set includes everything needed for railway fun: a spacious roundhouse engine shed, dozens of track pieces in curves and straights, trees, workers and even traffic signs; multi-piece trains; magnetic-tipped cranes; switches and a T-junction for changing course; suspension bridge, trestle bridge and roundtable, too! A tremendous value! Mix and match it with other train sets–it’s compatible with all popular wooden railway systems.